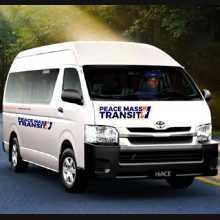 No doubt Peace Mass Transit PMT is one of the popular commercial bus operators in Nigeria. This post is will show you how to book Peace Mass Transit Motors Online, Bus Park Address and Current Price List 2019. Peace Mass Transit PMT is owned by Samuel Onyishi,since its inception it has grown massively to become one the popular transport companies in Nigeria. Q1: What are the requirements for booking Peace Mass Transit Motors Online? Q2: How do I book Peace Mass Transit Motors Online? Select your current location and branch you would want to book your ticket. Select where your traveling to,select traveling date. If you would want to hire the bus just tick on the “Book All Available Seats” check box. Click “Preview” button at the bottom. On the next page,carefully review your booking details via your booking summary,ensure that there is no error,you can edit or correct a mistake you made while filling. After review click on the “Make Payment” button at bottom. You will be redirected to webpay interswitch ng were you will make your payment. The booking fee will be displayed boldly to you. If the transaction was successful you will be notified on the PMT website and the ticket will be sent to your email address. Q3: How do I confirm that my pmt transaction was successful? Q4: Apart from booking online,how can I get a peace mass transit ticket? A: Walk into any PMT bus terminal station and buy a ticket,or you can call the customer care and book a ticket. Q5: I need the current bus park address of Peace Mass Transit PMT,all bus terminals in Nigeria? Liberty junction, by Ogwuago/Obinagu Road, Abakpa Nike, Enugu. No 7 Ngodo Road, Amangballa, Afikpo-North, Ebonyi State. 6 Achakpo Street, off Mba Street. 9 Shagari Road, opposite Market. No. 56 Bedwell Street, behind WATT Market, Calabar. No. 66 Umuida Road, Ogurute Enugu-Ezike. Opposite Garriki Market, Garriki, Enugu. Along Abuja/Lokoja Expressway, Opposite Brifina Hotel, Tagiri, Gwagwalada. Near Ibafo Police Station, Opposite Internal Revenue, Ibafo, Ogun State. Old Jebba Road, Agric Area, Opposite Kwara ADP, Along Sango Road, Ilorin. No. 96 IBB Way, Katsina. Gwagwalada Road, Near secretariat Junction, Kuje. By last bus stop, Keffi Road. No. 4/5 Owerri Road, by Nwafor Orizu Roundabout, Umudim, Nnewi. Along Markurdi Express Road, Obollo-Afor. 9/10 Western Avenue, Ojuelegba roundabout, opposite Abalti Barracks. No. 1B, by TARZAN, Owerri Road, Onitsha. Charity bus stop, opposite Army resettlement centre. No. 233 Aba Road, Opposite Boricamp Military Barracks, Rumola, Port-harcourt. No. 2 Crowther Street, Umuahia, Abia State. 39 Ajose Adeogun Street, Utako, FCT. UYO Peace Mass Transit Ltd, Terminal 6, Long distance Park, Itam, Itu LGA, Akwa Ibom. Q6: What is the Current Bus Price List Of Peace Mass Transit PMT?